As one of the most recognized names in skiing, Stein Eriksen has been synonymous with the sport and its elegance for more than 60 years. Among his most notable achievements, Stein was the first Alpine skier to win triple gold at a world championship. Considered the father of freestyle skiing, he successfully parlayed his passion and gift into a lifetime career. On Dec. 27, 2015, at the age of 88, Stein passed away at his home in Park City, Utah. 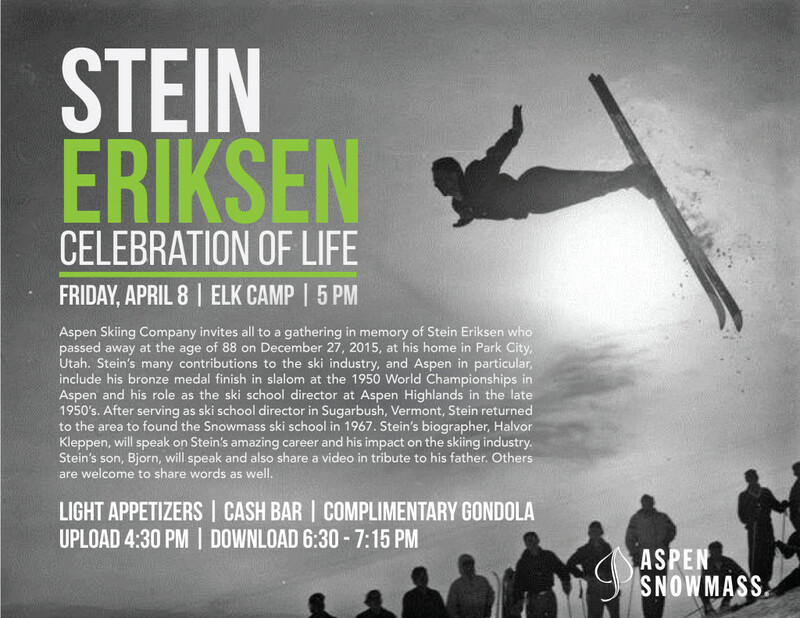 To honor Stein’s many contributions to the ski industry and Aspen, Aspen Skiing Company hosted a Celebration of Life on Friday, April 8, at Elk Camp. Light appetizers were served along with a cash bar and complimentary gondola rides to the top. Aspen Public Radio’s Barbara Platts attended and reported on the gathering. Stein spent much time in Aspen throughout his storied career. He won the bronze medal in slalom at the 1950 World Championships held on Aspen Mountain. He also served as ski school director at Aspen Highlands in the late 1950s. After serving as ski school director back east at Sugarbush in Vermont, Stein returned to the area to found the Snowmass Ski School in 1967. Stein’s biographer, Halvor Kleppen, spoke to Stein’s skiing legacy and impact on the industry at large. His son, Bjorn Eriksen, also spoke and shared a video tribute to his father. Others were invited to share words, as well.